Welcome to Jackson Friends Church Nursery Tree! We welcome all children from birth up through 2 years of age to our newly remodeled nurseries. We offer nursery care during worship services, the Sunday Life Group hour, Wednesday nights and many special events. A pager system allows parents peace of mind, knowing attendants can reach them quickly in case their child needs attention. 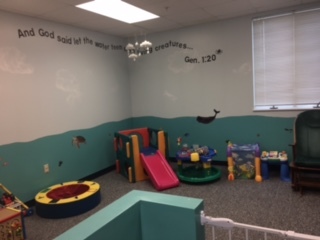 Our nursery provides a safe, caring environment for your child to learn about God while learning valuable social skills. Let’s take a virtual walk through the nursery! Upon arrival at our Nursery Check-In, you will be given a 4-part security sticker to fill out. Should your child have an allergy or special need, your child will be given a special alert bracelet to wear to notify the nursery attendant. You will be given the security stub part of the sticker back, along with a pager (The child will only be released to the person returning these.). 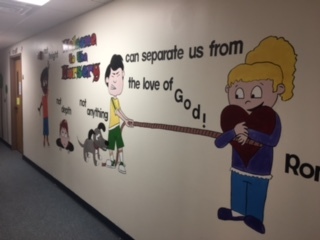 Our goal is to always provide your child a safe environment to learn about God. You will then proceed down the nursery hall, to the appropriate nursery room based on your child’s age. 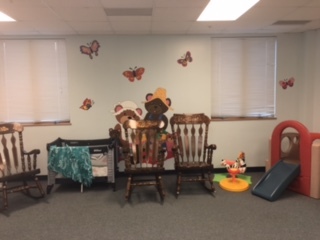 This is our Infant Nursery Room A (this room is used on Sunday mornings during the 10 and 11 a.m. services). This room has an “Under the Sea” them. All babies from birth to 18 months will be in this nursery. There are plenty of safe toys in the play area where we encourage the babies to play nicely together. 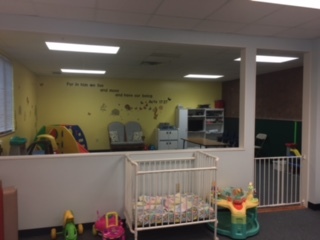 We also have a separate quiet room for sleeping babies &/or nursing moms. 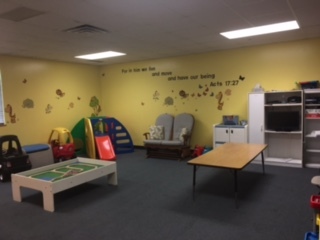 This is our Infant Nursery Room B (this room is used Sundays during the 9 a.m. hour, as well as during special services.) We have a delightful “Teddy Bear/Butterfly” theme. All babies from birth to 18 months will be in this nursery. Your baby will be held, rocked and played with by our loving attendants. (Please know that we never let a baby cry for more than 5 or 10 minutes without notifying you.). We encourage all attendants to pray for your child. 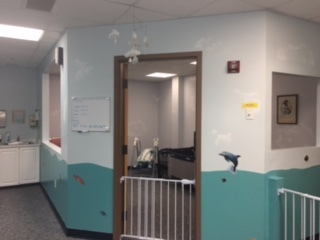 This is our 18 mos through 2’s Nursery Room C (this room is conveniently connected to Nursery B and has access to our children s bathroom). This nursery is brightly decorated with a “Jungle theme”. 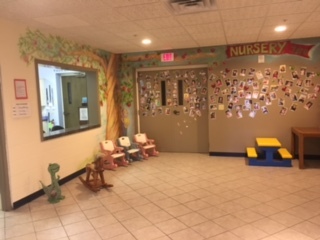 This nursery is used during all service times. Marty Shomali is our Nursery Director. Feel free to e-mail her with any questions you may have.